Top of the morning to ya me lovely! My name’s Paddy, the cheeky Clover Bingo leprechaun! 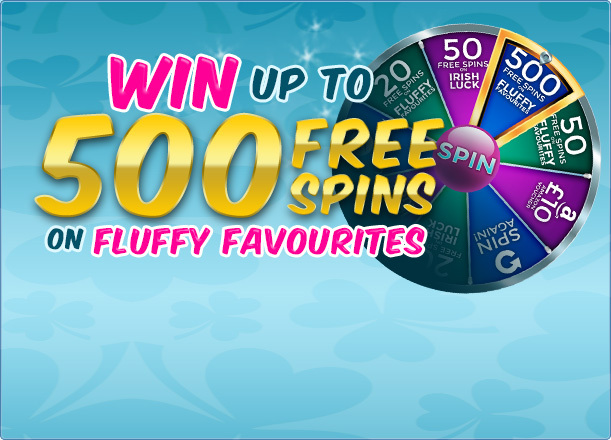 Sign up now and spin the Mega Wheel right away when ya deposit a wee £10; that’s up to 500 Free Spins on Fluffy for you to play with! We have a right craic at Clover Bingo me lovely; all of me site roomies are busy playing the very best 90 ball and 75 ball bingo you’ve ever seen. Free bingo, progressive bingo, jackpot bingo… there’s a lot of leprechaun booty to go around! Oh and not forgetting me favourite online slots like Fluffy Favourites and Sugar Train. Maybe you're looking for some VIP treatment? Well me lovely, I’ve got quite the VIP scheme for ya - the more you play… the bigger your rewards! Daily cashback, bigger bonuses and access to exclusive free bingo games; I’m not gonna brag, but Clover Bingo runs rings round other bingo sites! And I have some fine folks in me bingo rooms to make your favourite games even better - me CMs will show you a right good craic! Watch out for chat games, loyalty point giveaways and much, much more. So what ya waiting for me lovely? There are mega jackpots to be won right now - sign up today! Don’t miss out on the latest Clover craic! Join us on Facebook or Twitter to get the most stay updated with the latest bingo offers, bonuses and deals.